Have you listened to your PC lately? I mean, really listened? If you’re lucky, your PC doesn’t have much to say. But if yours sounds like a box of pots and pans falling down a flight of wooden stairs or a helicopter trying desperately to take off, chances are good that it has a problem. We’ve gathered some of the noises worth worrying about: Just click the audio links in this article to hear a fan on the fritz, for example, or a hard drive headed for disaster. 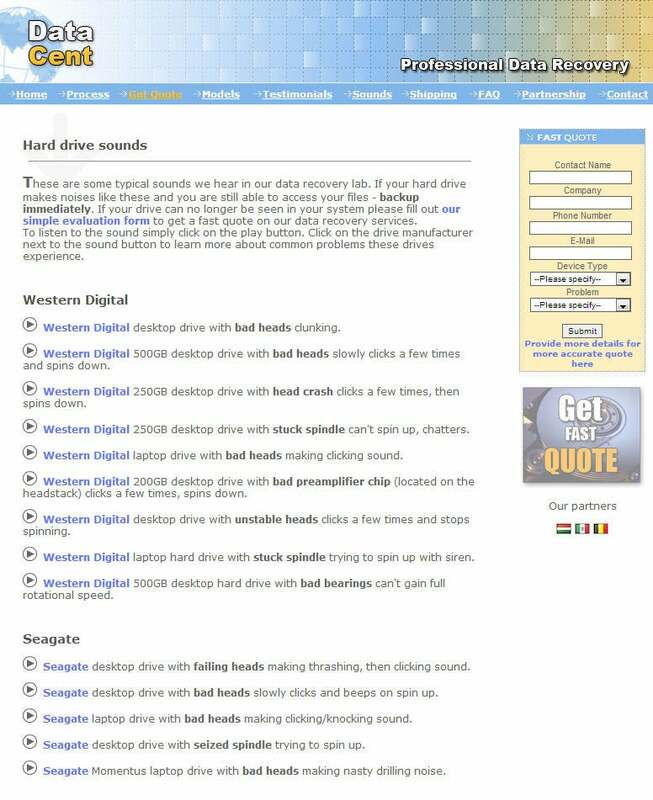 Hard-drive recovery company DataCent compiled a cacophony of clunking, creaking hard drives. With solid-state drives growing in popularity, noisy hard drives are becoming less of an issue. However, the spinning platters that store our dearest digital possessions will be around for years to come—and they are noisy. Whenever you access information from a hard drive or save to it, the mechanical platters inside spin up at insane speeds—between 5600 and 10,000 revolutions per minute—with a tiny magnetic head jumping all over the place. Be sure to defragment your hard drive regularly to minimize the space it has to jump. However, if you start to hear clicking noises, it’s time to be concerned. 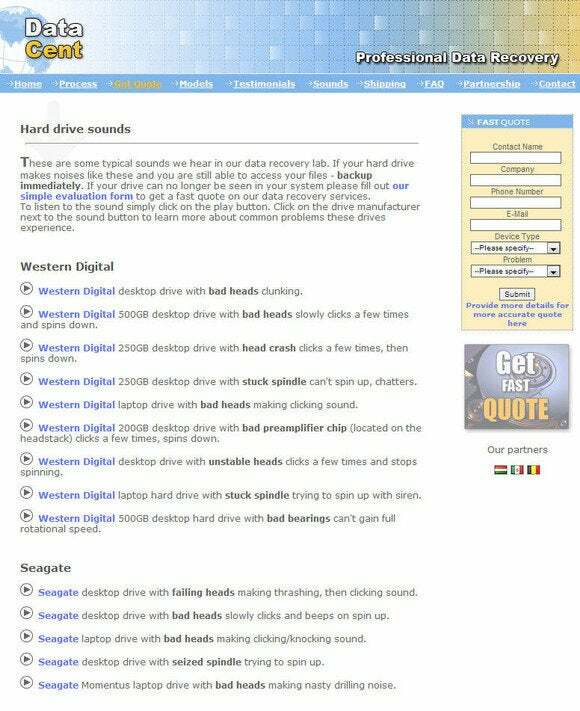 The head that writes to the drive may have gone bad, and the drive could be near death. Back up your data immediately and get into the market for a new drive. The usual hum and whir that most people associate with the sound of a PC come from the case fans and coolers for the vital components. Consider such sounds music to your ears, because these PC parts help to maintain a reasonable temperature. Too much heat, and you can kiss your stable PC good-bye. The modern BIOS usually is able to regulate how fast and hard the fans spin to adjust to a temperature change. If your PC is really pulling its weight on a current task, it may need a little extra air to cool down, resulting in a louder fan noise than you’re used to. Don't worry, the noise will pass—unless it doesn't. If your fans are continuously trying to mimic a Category 5 hurricane, it’s time to do some detective work. 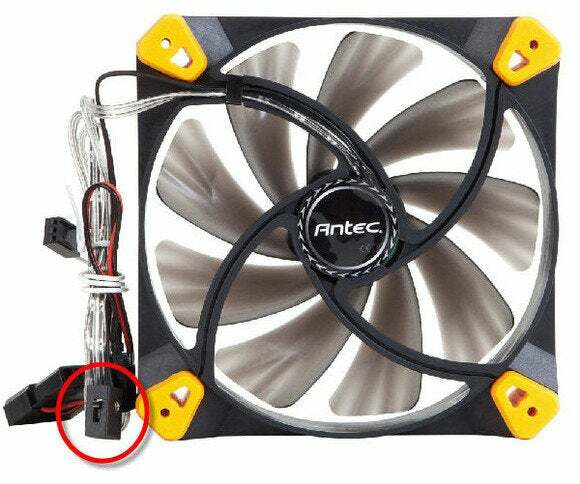 Some fans, such as the Antec True Cool, have physical switches to change the speed of the fan (circled). Many fans have individual switches to change their speed on the fly. The switch might be on the case, or it might be attached to the fan. A lower setting will push less air through your system but will also use less power and make less noise. The next option is to install fan-controlling software, such as SpeedFan. This utility takes over your PC’s fans and regulates when to run them at full speed and when to slow them down. You might even find a setting in your PC’s BIOS that allows you to set fan speeds manually, if you’re the DIY type. Check inside your PC’s case around all the fans for a stray wire that may be in contact with the fan blades. This is an easy fix, but the sound could scare any PC lover half to death. The optical disc is an aging technology, with digital distribution becoming the standard for PC software. Many PCs, however, still have some flavor of CD or DVD drive. Ordinarily, an optical drive makes a loud whirring sound when you insert a disc, because the drive spins the disc up to speed in order to read the data. It's easy to forget the disc in the tray, which can cause the drive to spin up at random times and when you start the system or program. If you're hearing such a sound annoyingly often, check the tray and make sure it’s empty. An empty tray can’t spin anything and make noise. If it’s empty and it’s still being noisy, you probably have a malfunctioning optical drive, possibly with some broken or loose parts. The BIOS has its own way of communicating with users, in the form of melodic beeps that represent certain errors. Don’t worry about a short, single beep at boot-up. Assuming the PC passes its POST (power-on self-test) procedure, everything is fine. But if your PC can’t get past the POST, and you’re hearing additional beeps from the computer—not the speaker (see below)—it’s trying to tell you something. Here, for instance, is a BIOS beep indicating that the memory is missing from the motherboard. This may seem like an obvious entry, but speakers can make some startling noises when you least expect them. When you’re powering your computer on or off, you might jump at the sound of a loud pop coming from your speakers. No worries: It just means that your speakers are amplified. They make such a noise when they gain or lose power. There isn’t much you can do about that sound, short of cutting power to the speakers or unplugging them when you aren’t using them. Muting will help with annoyances while you’re using the system, but the loud popping will persist. Check the cables that run from the speakers or subwoofer to the PC and make sure that they are in the correct port (the line-out port, usually green) and securely plugged in all the way. 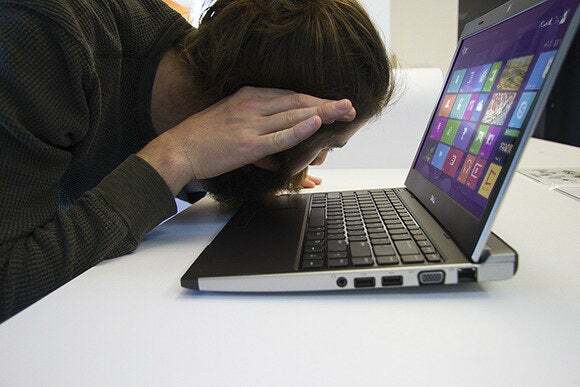 The good news is, these days the typical PC has few moving parts, so just a handful of components could be the culprit behind a worrisome noise. With some careful sleuthing, you usually can identify the component and understand how to work toward a fix. So sharpen your ears and be ready to run to your PC’s side when it calls for help.